“Livro da Criação” (“Book of Creation”), from 1959-60, comprises 16 square boards that translate prehistory into pure form: Red and white triangles suggest the discovery of fire, a folding fan stands for the invention of the wheel, and a rotating red disk symbolizes the invention of timekeeping. (You can fiddle with a replica here, fitting its cutouts together or spinning one page’s concentric rings.) 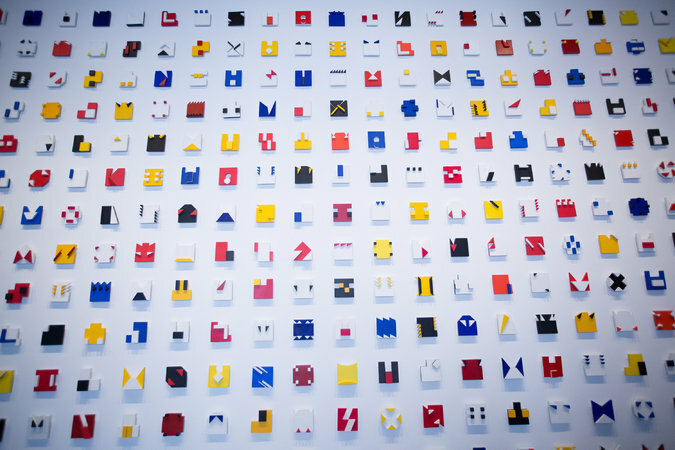 Later, displayed on a cramped wall you wish were a little longer, comes the 365-element “Livro do Tempo” (“Book of Time”), 1961-63, a major work from Pape’s Neo-Concrete period whose red, yellow and blue reliefs function as a sort of abstract calendar. An image from a staging of “Divisor” (“Divider”). So Pape’s art was already taking on elements of action and personal experience before April 1, 1964, a few days before her 37th birthday. That day, a coup d’état overthrew the left-wing president João Goulart, prefiguring two decades of military rule. In the coming years, the junta’s stance on freedom of expression hardened, culminating in the notorious Institutional Act No. 5, which legalized censorship, banned protests and cleared the way for torture. So Pape, who marched against the dictatorship, veered again. “Caixa das Baratas” (“Box of Cockroaches”), from 1967, is just what it says it is: an entomological graveyard, displayed in a mirrored acrylic box. The same year, she took a huge white sheet, sliced at regular intervals, to one of Rio’s many favelas. The children to whom she presented the sheet popped their heads through the slits, laughing and sticking out their tongues, as they unified their bodies into a collective organism that breathed and undulated, as gracefully as an octopus in the sea. “Divisor” (“Divider”) became one of Pape’s most significant artworks; she restaged it several times in 1968 in much more glamorous parts of Rio. A social sculpture, it was complete only with group participation — though it was also, in a reversal typical of ’60s Brazilian art, a biting metaphor for government surveillance and limits to freedom. “Livro do Tempo” (“Book of Time”). “Divisor” stands at the heart of this retrospective. Along with footage from the 1967 favela performance, there is a video of a re-enactment in 2010 projected on a full wall. 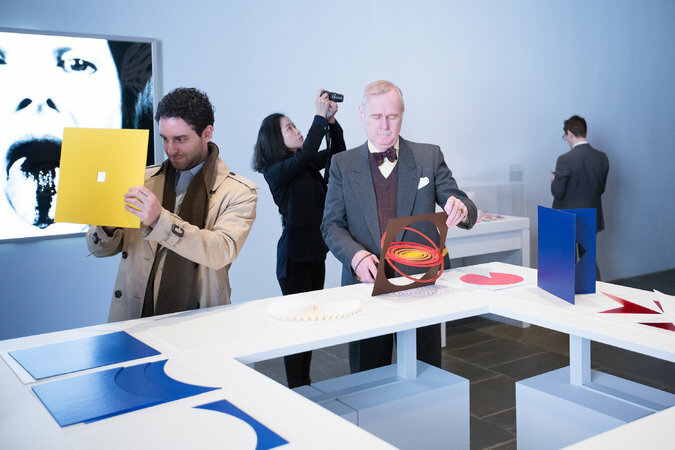 (“Divisor” is also being restaged at 11 a.m. on Saturday, in a walk from the Met Breuer to the museum’s principal home on Fifth Avenue.) 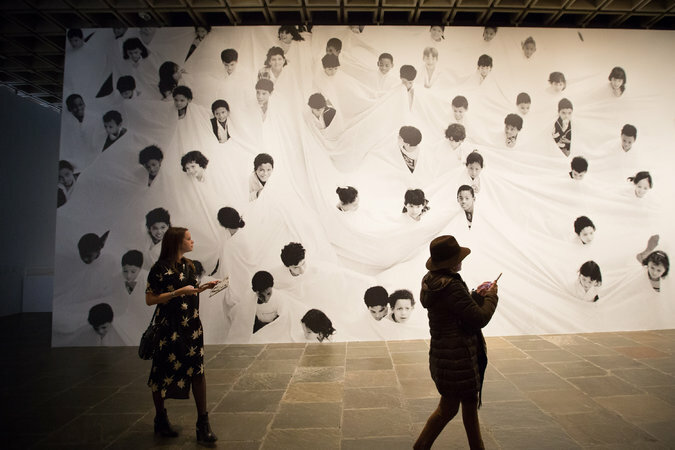 Yet the compressed installation of this show shortchanges other moving-image works, particularly her politically trenchant films of the 1970s, made while many other Brazilian artists were in exile. Several of these films play on a loop in a tiny black box, and interesting but unessential materials, like title designs she did for Cinema Novo directors, delay the projection of major later works like “Carnival in Rio” (1974), a sociological portrait with a samba beat, and “Catiti-Catiti” (1978), a biting superimposition of Ipanema Beach glamour shots and darker texts about Brazil’s colonization. Others are shown awkwardly at waist height, or on small screens in a darkened hallway. A proper film program would have helped. Visitors may interact with a facsimile of “Livro da Criação” (“Book of Creation”). Much of the Breuer’s fourth floor has been cleared for a ravishing late work, “Ttéia 1,” in which hundreds of golden filaments stretch from the ceiling to a large central platform. It’s dazzling; it’s sultry; it’ll be selfie central. But don’t let it sidetrack you from Pape’s more pugnacious work with the camera, from her Super 8 footage shot in a favela on the sea to her documentary “A Mão do Povo” (“The Hand of the People”), from 1975, which contrasts indigenous Brazilian art and handicraft with consumerist junk in Brazil’s big cities. What the times required — and what today’s Brazil, today’s America, may require, too — was neither art for art’s sake nor blunt propaganda, each in its own way a cop-out. They required an art plunged into life itself, uniting disparate figures into new fellowship, all under a common sheet.